The originally titled The Emperor of the North Pole (before producers cut the first and last words fearing audiences would think the film belonged to the box office poison genre of Antarctic movies such as Scott of the Antarctic [Charles Frend, 1948]) became the last collaboration between Robert Aldrich and Lee Marvin. They had made three films together: the same number Aldrich did with Jack Palance (an actor he believed had the same potential as John Garfield) (1). Although Marvin continued to make films until his fatal heart attack in 1987, Emperor of the North represents his “last hurrah” as star and Aldrich actor – Samuel Fuller’s The Big Red One (1980) functioning as an “Indian summer” before the disappointing work of his final years. Although Emperor of the North was a critical and commercial failure on first release, the passage of time has aged it like a vintage wine not appreciated at its birth. Despite the fact that it never matches Aldrich’s major achievements, Emperor of the North resembles the intriguing “lesser” films of a director such as John Ford whose The Wings of Eagles (1957), The Last Hurrah (1958), The Horse Soldiers (1959), Two Rode Together (1961) and Donovan’s Reef (1963) contain intermittent cinematic pleasures within admittedly flawed frameworks. Marvin embodied Aldrich’s anti-authoritarian attitudes within the three films they made together, whether as hero or villain. However, Aldrich’s cinema destabilised such clear categories of good and bad, particularly in Attack! (1956). Although Marvin’s Colonel Bartlett appears to be the villain of the piece, he actually resents the ignominious social status assigned to him in his small Southern town where he acted as clerk for a Judge who had an incompetent son, and whom he now aims to make a war hero – whether dead or alive – to advance his future post-war political career. Bartlett plays his own game within the system aiming to gain the “high card” that will enable him to survive no matter who he sacrifices in the process. Here he anticipates Marvin’s Major Reisman of The Dirty Dozen (1967). Emperor of the North situates the Marvin character in an earlier decade. Marvin and Borgnine, who also appeared in The Dirty Dozen, are older but not wiser and now inhabit a Depression-era that influenced the formative years of the young Aldrich. These reluctant collaborators from The Dirty Dozen are now ruthless enemies similar to those liberal and conservative allies in World War Two who rapidly changed into Cold War antagonists; the latter betraying their former associates once the political climate shifted. Like his earlier Aldrich characters, Marvin’s A. No.1 seeks to play the system for all that it is worth. But this time, the goal is less one of personal survival than of maintaining status in a changing world as advancing years gradually begin to take their toll. Emperor of the North is set in 1933 in the midst of the Great Depression. Despite his privileged background, Aldrich knew that a much bleaker world existed outside his affluent environment of Rhode Island (2). He never glamorised the Depression era. It was an ugly world of social Darwinism as The Grissom Gang (1970) revealed. Like many who knew the 1930s, Aldrich feared the return of this decade’s grim conditions. 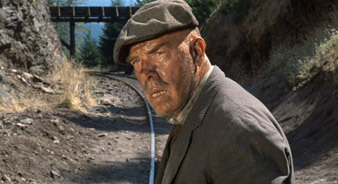 He became concerned about the decline of heavy industry in the Reagan era while choosing locations for …All the Marbles (1981) as his son William Aldrich remarked (3). Made in the same year that Marvin delivered one of his finest (if underrated performances) as Hickey in The Iceman Cometh (John Frankenheimer, 1973), the actor returns to Aldrich’s world playing a more aged and world-weary character. Christopher Knopf’s “final” screenplay set the film in 1931 during the final years of Herbert Hoover’s Presidency (4). By contrast, Aldrich moved the action two years later to the height of the Great Depression, and included a radio broadcast by a new President whose New Deal projects actually did very little to alleviate economic hardship. Based upon the legendary hobo Leon Ray Livingston (1872-1944), Marvin’s A No. 1 anticipates John Steadman’s Pop in The Longest Yard (1974) but with still enough energy to fight Shack (the brutal train guard played by Borgnine) in the film’s concluding scenes. However, unlike Pop, who is placed alongside Burt Reynolds’ Paul Crewe, he will have no member of a younger generation to heed his advice. The rules of the game have changed. The Marvin character is still a survivor, but he experiences more disillusion than ever before. He mentors the devious young hobo Cigaret (Keith Carradine) but discovers that this representative of the younger generation will betray him in their joint endeavors to challenge Shack (5). The type of teamwork represented by The Dirty Dozen is now impossible. During one sequence in the film, A No. 1 visits a hobo camp as a radio plays one of Franklin D. Roosevelt’s fireside radio broadcasts. Doubting the value of any political solutions from above, the weary tramp switches off the radio. He is hailed in a community of outcasts as the “Emperor of the North Pole”. But that very title designates nothing. It embodies the bleakness and pessimism that underlies the film’s deceptive veneer of a period movie involving a bloody contest between two macho screen veterans who had begun their careers as heavies (sometimes, as in John Sturges’ 1955 Bad Day at Black Rock, in the same film), gained Academy Awards, and were now moving towards their twilight years in Hollywood. The climactic fight is the highlight of the film. But, like the title, “Emperor of the North Pole”, it means nothing and changes nothing. A No. 1 and Shack have their respective codes of honour. But “their eventual climactic fight is individualistic rather than political. Emperor of the North really works as a competitive game between two opposing forces with personal systems of honor rather than as an overt political allegory.” (6) However, political issues are not absent from the film as the devious manipulative figure of Cigaret reveals. He represents the opportunistic generation of the 1960s who would become another cog in an oppressive establishment decades later. Despite saving him from Shack’s brutal use of a coupling-pin to injure any hoboes riding the rods, A No. 1 soon experiences ingratitude from Cigaret when he finds himself facing a similar torture (7). Emperor of the North intermittently merges two Hollywood cinematic styles, classical and modern, to help further several ominous parallels between the 1930s Depression and a 1970s recession characterised by the Oil Crisis. The film opens with an iris, an optical device used frequently in the silent era. A wipe occurs later. But the film also employs split-screen techniques that Aldrich would later use in The Longest Yard and Twilight’s Last Gleaming (1977). Simon Oakland’s cop engages in a Keystone Cops-like chase of A No.1 and Cigaret before his eventual humiliation at a hobo camp. The 1920s may have been the “golden age of comedy” but it was also one of the most reactionary decades in American history, especially for the oppressed members of society. A No. 1 and Shack represent two opposing systems caught in an eternal struggle. A No. 1 eventually wins and tosses Shack overboard in the same manner that his antagonist had thrown hoboes off his train earlier. The ingratiating Cigaret suffers the same fate. He has shown himself unworthy to be part of a “team” with a more honourable and senior figure. Unlike The Longest Yard’s Paul Crewe, he is incapable of any form of moral regeneration, the kind that the John Garfield character in Body and Soul (Robert Rossen, 1947) and Force of Evil (Abraham Polonsky, 1948) experienced in those Enterprise Studio productions on which Aldrich worked as assistant director. Emperor of the North concludes appropriately with Marvin’s final and most memorable exit in any Aldrich film. A lyrical long shot shows A No. 1 triumphantly enthroned on Shack’s train – for the moment, at least, since his adversary shouts off-screen and from a distance, “You ain’t seen the last of me” – as the machine moves away into a beautiful landscape and blue sky. Marvin’s character enjoys temporary victory over both his adversaries. He speaks his last words to Cigaret, articulating Aldrich’s cinematic philosophy regarding the personal and political alliance of body and soul and the necessity of balancing positive feelings with progressive ideals. Despite the individual nature of the contest, Aldrich’s real feelings still remain, despite the presence of adverse circumstances. Kid, you ain’t got no class. You could have been a meat eater, kid. But you didn’t listen…. You had the juice, kid, but not the heart, and they both go together. Had Emperor of the North succeeded at the box office, Aldrich would have gained those aces he needed at the Hollywood card table to play his “high card” in the system by casting Marvin in the role eventually taken by Robert Mitchum in The Yakuza (1975), later directed by Sidney Pollack. But Mitchum had the “high card”, and the difficult star of Aldrich’s The Angry Hills (1959) – in which he gave a bored “walk-on” performance resembling the one he would deliver in The Yakuza – used it against the director. Had Aldrich won he would have fired Mitchum and cast Marvin in his place opposite Takakura Ken, the real hero of the director’s Too Late the Hero (1970). With this dream casting, Aldrich could have succeeded where Pollack failed in using two different national cinema stars who portray ageing ex-soldiers with complimentary codes of honour. One can only dream of what might have happened had Emperor of the North achieved better commercial and critical recognition. See Tony Williams, Body and Soul: The Cinematic Legacy of Robert Aldrich, Scarecrow Press, Lanham, MD, 2004, p. 230. For some brief accounts of Aldrich’s early life amidst his privileged background, see Edwin T. Arnold and Eugene I. Miller, The Films and Career of Robert Aldrich, University of Tennessee Press, Knoxville, Tennessee, 1986, pp. 1-5; Alain Silver and James Ursini, What Ever Happened to Robert Aldrich? His Life and His Films, Limelight Editions, New York, 1995, pp. 3-4. Arnold and Miller, p. 228. Christopher Knopf, The Emperor of the North Pole, Final Screenplay, 16 May 1972. Despite the introductory logo, several revisions up to 28 June 1972 occur in this edition. In The Road (The Macmillan Company, New York, 1907), Jack London refers to newcomers to the hobo lifestyle as “gay cats” or “tenderfeet”. Both A No. 1 and Shack immediately place Cigaret in this category. Knopf’s screenplay reworks two original sources: London’s actual hobo experiences during 1894 depicted in The Road and A No.1, From Coast to Coast with Jack London, The A No.1 Publishing Company, 1917. London had met A No. 1 during 1894 but never mentioned him in The Road. London had read an earlier version of this work but regarded 98% of it as pure fiction: “You are making a mistake in telling folks this fairy tale, for some of them have read, or will some time read, my entirely different version of why I quit the Road”. Jack London to Leon R. Livingston, 28 October 1911, The Letters of Jack London. Volume 2: 1906-1912, ed. Earle Labor, Robert C. Leitz, III, and I. Milo Shepard, Stanford University Press, Stanford, California, 1988, p. 1047. A No. 1 visited London at his ranch in 1911. For a photograph of both men see Russ Kingman, A Pictorial Life of Jack London, Crown Publishers, New York, 1979, p. 235. Contrary to Theodore R. Hazen’s DVD review of Emperor of the North and inaccurate description of the final chapter of A No.1’s book, Keith Carradine’s Cigaret bears no relationship to Jack London. See: http://www.amazon.com/Emperor-North-Lee-Marvin/dp/B000EXDSCU.